Stitchers Anon: Living! Stitching! Winning! Giving! Living again! Living! Stitching! Winning! Giving! Living again! Happy Tuesday everyone. Poor Tuesday is never reallly appreciated is it? We are still sulking a bit at the onset of Monday with the 'I hate Monday' blues, and it is too far away from Friday to enjoy any of the 'Friday Feeling' fun and buzz that we get as the weekend approaches. No idea why I am commenting on what day of the week it is, perhaps I had better move on. I've been very busy designing, stitching, not liking, frogging, re-sketching, re-designing and then stitching again. I've also taken two huge steps forwards with my life. First, completely peed off with paying £ 5.00 postage fees to get a SINGLE thread sent over from the UK, I've decided to become an Irish DMC stockist. Hopefully even with the cost of import, 23% VAT etc, etc, I can offer people in Ireland cost effective goods without leaving them feel as if they have been well and truely ripped off. That was the first big step: my order of fabric has been made and paid for so I will let you know when it gets here. The second big step was the fact I paid for the order on the 13th of October and it didn't even register with me that it was the third anniversary of the breast cancer diagnosis. So I am now a three year survivor! And I didn't even realise! And this is wonderful because it means slowly and surely I'm getting my life back. Cancer takes over everything and there isn't a day goes by when I don't think about it BUT for that period of time, I was thinking about myself, my business and my move forwards with my life. So the Cancer is being pushed out of my mind and that can only be a good thing right? I am getting 'me' back again. I am living! Now for some stitching news. I've sent an exchange and received an exchange but I can't show you any of them yet because the big reveal is on the 18th (please tell me I got that right Kim!). Needless to say I am thrilled with what I received and can't wait to show you, but I will have to. Darn, patience is not my strong point! The Ghost of Christmas Present is growing again after the issues I mentioned above. It hasn't been a particularly difficult stitch, I just decided half way though that I really didn't like his coat. And if I don't like it, it isn't being released...so re-designed it was! I still have a way to go with it though. 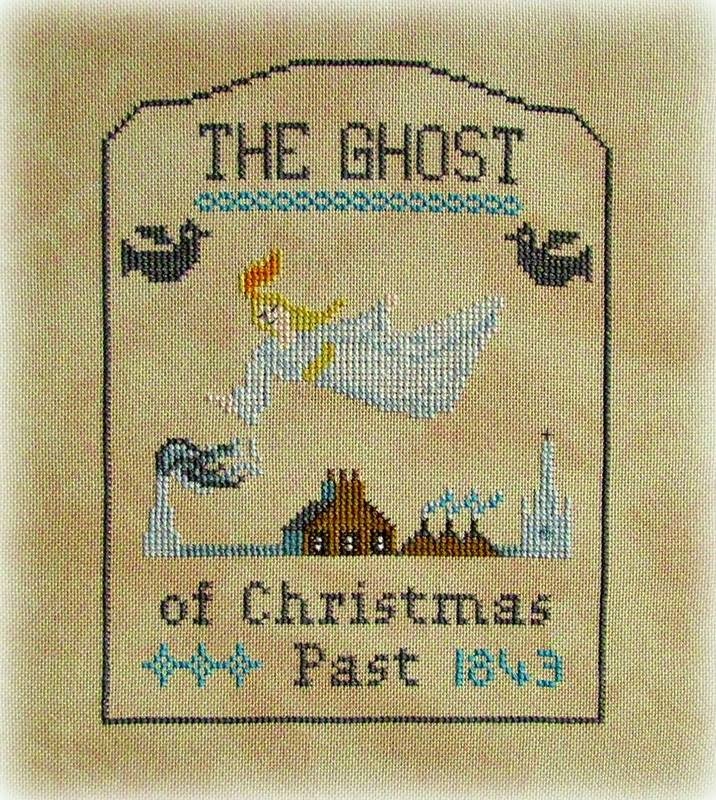 And thankfully, thanks to Elaine my super stitcher, I can show you the Ghost of Christmas Past. I love it and Elaine has done an amazing job with it. Both designs are stitched on Weichelt Clay hand-dyed evenweave (Jobelan I think). The light changed between morning and afternoon so the fabrics look completely different but they're the same. I'll get them photographed together when they're both done. It came out just as it looked in my head! 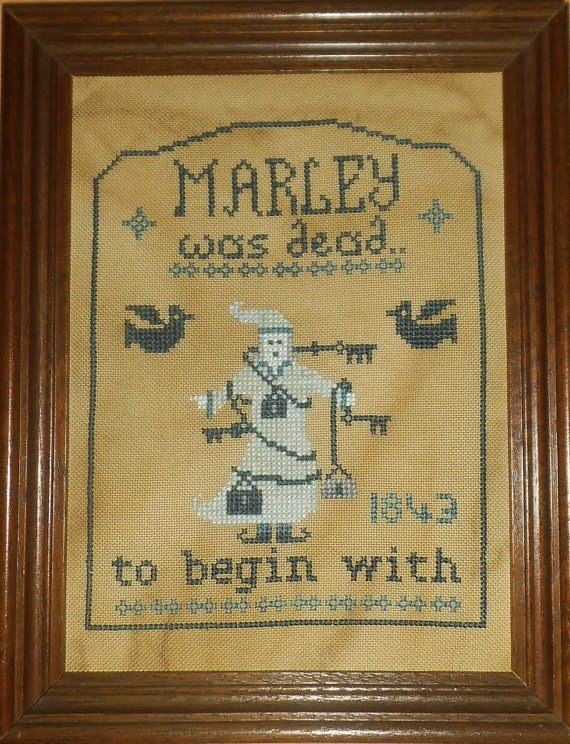 I'm thrilled with it, and of course I have designed them all to go with Marley. So, that is Living and Stitching. What about winning? Well I remembered I was having a blogoversary prize draw and drew the winner. Poor Angela took great efforts to tell me how to copy and paste the random number thingy-ma-jiggy...but I forgot, so you will have just have to take my word for it. I'm generally trustworth lol (yes, it is indeed nearly time for the Muppet Christmas Carol!). And the winner is ..............da dah! Cucki! Congratulations Cucki. I will send you a little something hand made by me soon! I will even put it up on my sidebar so I don't forget! Now for a little reminder and the Giving part of the title. We only have 16 days to reach our target of 500 euros. We are at 369 euros! Will we do it do you think? Please, if you have one euro, one dollar or one pound to spare, pretty please donate here and you will be put into the prize draw! Here is a bit more of an incentive. We have another wonderful prize being donated by Angela's mum: I will share a picture as soon as it is finished. I am so very grateful to have made such wonderful friends since I started my blog all those years ago. This fundraiser is turning into a mega crafting community effort and I am humbled continuously by how you are all supporting me. 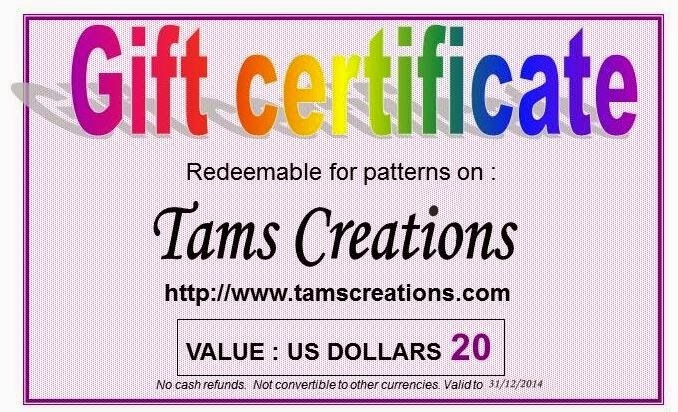 Until I can share Angela's mum's wonderful gift (methinks Angela's mum might have a name which I feel I should make an effort to find out: sorry Angela), we have had another gift voucher donated by an amazing designer, Tam Jones. I swear, when I popped over to have a nosey, my wishlist grew far faster than my bank balance ever will! You need to pop over and take a look. The owl, boy did I drool over the owl! Tam of Tam's Creations has donated this. Whichever lucky winner wins this will have their details given to Tam who will issue instructions on how to use it. What an amazing gesture Tam. Thank you so much. And back to living again. 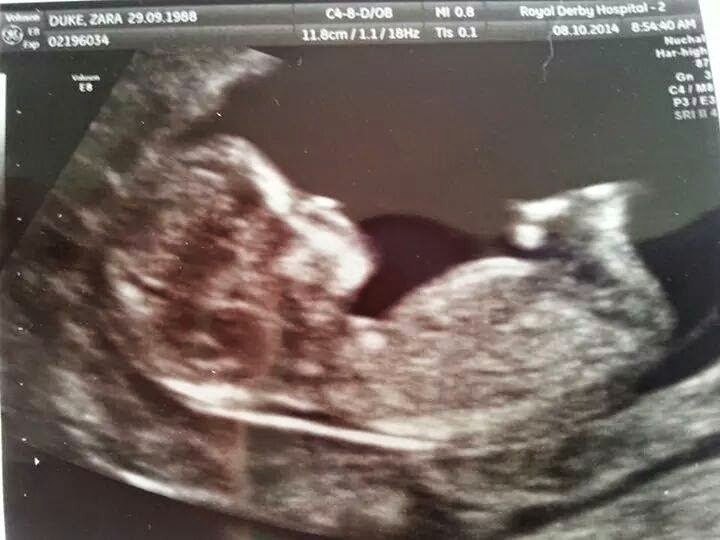 As most of you know my daughter is pregnant with my first grandchild. It has been a rocky road so far but she's being closely monitored and the diabetes (type one) seems to be behaving even though she has dreadful morning all day sickness. Whatever happens though, this baby is and always will be my first grandchild and it is as loved as any child even though it isn't here yet. 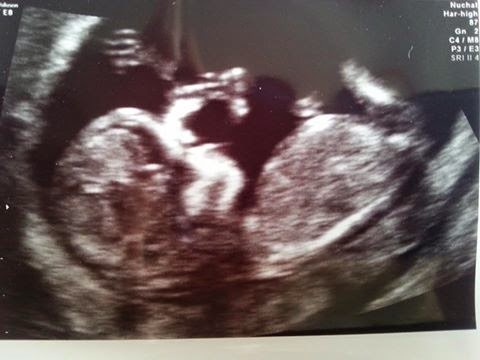 I would like to introduce you to this very special little person, just 12 weeks in the making. And on that very special note, I will leave you and get ready for an evening by the fire stitching and dreaming of babies. What clear photos of the new grandchild - congratulations! Thanks I think for the link to Tam's website...will have to hope I'm a winner! Lots of lovely news from you today, so glad to hear you're happy. Hip Hip Hooray!! What a wonderful day! So many good things happening, life is good! Yay to getting your life back and a baby on the way! Also, the patterns are super nice! Amazing pictures of your grandchild Gaynor. Congrats to the winner. I love your new designs. And isn't it great to be able to see these "pictures" of the little baby before his/her birth? Just amazing. It's happening!! You're going to be a Grandmother!! :D Fantastic news, glad everything is going well! Amazing sonogram photos - hard to imagine your grand-baby is just 12 weeks. I'm so excited for you and praying for baby and momma's health. So glad you've been concentrating on good things and are truly back among the living. I think you may be the strongest person I know. What a clear scan pic...wonderful. Happy to read all of your fantastic news :) My Mum's name is June and I think the scarf is just about finished! How was that for quick? I will email you soon with a picture. Brilliant news about the baby. Also congratulations on your 3 year anniversary. A wonderful milestone. It's 3 years this month since my niece had her bone marrow transplant. A long road to recovery with steps back now & again but lots to be thankful for especially when you have 2 young children. She did the Great North run this year & beat her best time before her diagnosis. She runs for the Anthony Nolan Trust which found her donor. So many wonderful cancer charities to be thankful for & support. Thanks for the visit to my blog. I've been very lax lately only partly die to travelling. Do hope I get back to Austria again. That was funny what you said about their snow being the wrong kind.